With symbols representing Kathakali and the warriors of the region arranged suggestively in a far corner of Rukmini Arangam, (curiously, it resembled Krishna seated on an elephant), ‘Nalacharitham’ unfolded in its dramatic glory. 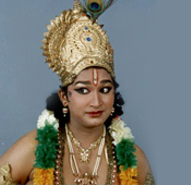 The four-hour performance was powered by Sadanam Balasubrahmanian’s commanding presence as the brave King Nala, the comic and dramatic visuals of the animated golden swan (Sadanam Bhasi), the quiet dignity of the heroine Damayanthi (Kalamandalam Shanmukhan) and sublime music. Hearing about Damayanthi from Sage Narada and others, Nala gets infatuated. In a beautiful progression of the romance within Nala, the padam ‘Kundina Nayaka’ in Kalyani raga builds up the intensity of emotion slowly until it reaches a crescendo in the gloriously sung padam, ‘Anudinam Valarunnu Anuragam,’ also in Kalyani. Music and the emotion matched in glorious harmony, one leading the other in a burst of creative beauty. Nala pines for Damayanthi and describes her ‘thick, long, curly hair like the dark clouds’ with much intimacy and relish in ‘Mudhira Thathi’ padam (Kalyani), it was acting at its most subtle and intense level. The tragicomedy style prevalent in Kathakali dramas came to the fore in Nala’s diversions with the veena and the mridangam, that turn out to be futile. It turned unabashedly comic when the golden bird cries piteously when Nala catches it, saying he is his mother’s only son that his wife has just given birth. There is so much to relish in the drama written over two centuries ago - the style of storytelling, the little details, the theatrical tools such as the narration in between, the conversations that are almost soliloquies in themselves because the participation or movement from the listener is minimal, the sublime music and the emphasis on the lyrics, the list is endless. The music by Kalanilayam Unnikrishnan and Sadanam Shivadasan (vocal), Kalamandalam Balaraman (chenda), Kalanilayam Prakasan (maddalam) and Sadanam Ramakrishnan (edakka) was an inspiring experience on its own.